Room with 14m2 in the 5th floor. Includes a queen-bed (1.50 m X 2 m). 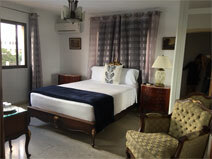 This rooms includes private bathroom with cold and hot water 24 hours, soap, hair dryer and bath ropes. Also includes a mini fridge, safe box, air conditioner, plasma TV with USB/CD-DVD player. Room in the 11th floor decorated with a modern style with 20m2. Includes a 2x2 king-bed. This rooms includes a private bathroom with cold and hot water 24/7, soap, hair dryer and bath ropes; this room also includes a mini fridge, safe box, air conditioner, plasma TV with USB player. Room with 27m2. 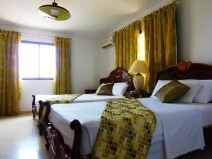 Includes a queen-bed and a ¾ bed, ideal for three persons. This rooms includes rivate bathroom with cold and hot water 24/7, soap, shampoo, body cream, hair dryer and bath ropes; this room also includes a mini fridge, safe box, air conditioner, plasma TV and CD-DVD player. Master room with 30m2. 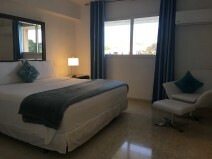 Include private bathroom with cold and hot water 24/7, soap, shampoo, body cream, hair dryer and bath ropes; this room also includes a private terrace with view to the ocean, mini fridge, safe box, air conditioner, plasma TV, CD-DVD player, a king-bed and you are able to add an extra bed. Room with 20m2 in the 11th floor decorated with a modern style. Includes a (2 m x 2 m) King-bed. This rooms includes a private bathroom with cold and hot water 24/7, soap, hair dryer and bath ropes; this room also includes a mini fridge, safe box, air conditioner, plasma TV with USB player. Room with 27m2 in the 11th floor decorated with a modern style. Includes a (2 m x 2 m) King-bed and you are able to add an extra bed (by clicking on "change number of guests for this accommodation" in the "Select" column on the booking form). This rooms includes a private bathroom with cold and hot water 24/7, soap, hair dryer and bath ropes; this room also includes a mini fridge, safe box, air conditioner, plasma TV with USB player. Master Room with 30m2 in the 11th floor decorated with a modern style. Includes a (2 m x 2 m) King-bed and you are able to add an extra bed (by clicking on "change number of guests for this accommodation" in the "Select" column on the booking form). 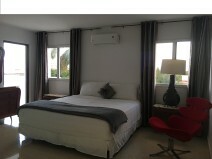 This room also includes a private terrace with view to the ocean where you can have a private breakfast, a private bathroom with cold and hot water 24/7, soap, hair dryer and bath ropes; this room also includes a mini fridge, safe box, air conditioner, plasma TV with USB player. Room with 11.5 m2 in the 11th floor Small Standard room with view. Includes a Queen-bed (1.50 m x 2 m). This room also includes a private bathroom with cold and hot water 24/7, soap, hair dryer; this room also includes a mini fridge, safe box, air conditioner, plasma TV with USB player. Room with 14m2 in the 4th floor. 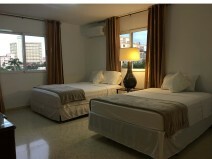 Includes a King-bed, This rooms includes private bathroom with cold and hot water 24 hours, soap, hair dryer and bath ropes; this room also includes mini fridge, safe box, and air conditioner. Room with 16m2 in the 4th floor. 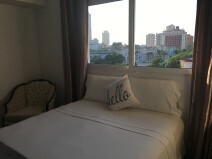 Includes king size bed, and private bathroom with cold and hot water 24 hours, soap, hair dryer and bath ropes; this room also includes mini fridge, safe box and air conditioner. Room with 27m2 in the 4th floor. Includes a Queen-bed and Standard-bed, ideal for 4 persons (Please check the number of persons by clicking on "change number of guests for this accommodation" in the "Select" column on the booking form). 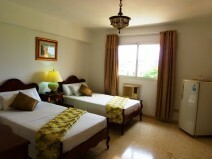 This rooms includes private bathroom with cold and hot water 24 hours, soap, hair dryer and bath ropes; this room also includes mini fridge, safe box, air conditioner, plasma TV with USB player. Master Room with 30m2 in the 4th floor decorated with a modern style. Includes a 2x2 king-bed and you are able to add an extra bed (by clicking on "change number of guests for this accommodation" in the "Select" column on the booking form). 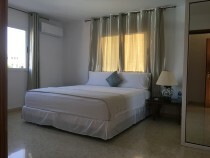 This rooms includes a private bathroom with cold and hot water 24/7, soap, hair dryer and bath ropes; this room also includes mini frigde, safe box, air conditioner, plasma TV with USB player. Room with 11.5 m2 in the 4th floor Small Standard. Includes a Queen bed. This room also includes a private bathroom with cold and hot water 24/7, soap, hair dryer; this room also includes mini frigde, safe box, air conditioner.